Is Your Equipment Costing You Money When Trading Over Wi-Fi? Trading is all about the bottom line. And getting the best possible equipment for your trading setup has a direct affect on your bottom line. In my last post, I talked about the different Wi-Fi standards, including expected speed, frequency, and signal distance. We saw that Wi-Fi 4 (802.11n) operates at considerably slower speeds than Wi-Fi 5 (802.11ac). Wi-Fi 6 (802.11ax) is the fastest, but isn’t available yet. While that last post may be more tech talk that you normally care for, if you have to trade over a Wi-Fi connection, a little understanding of the tech can be crucial. In today’s post, we’ll talk about what to look for when buying the components of your wireless system. Hint: it’s about more than just the router. What if you have a Wi-Fi 4 router, but even the 2.4 GHz band isn’t getting a strong signal to the nether reaches of your house? Just going to a higher speed and frequency (i.e., Wi-Fi 5 and 5 GHz) won’t necessarily help. The higher frequency cannot penetrate solid objects like walls and floors. And ceramic tile is the worst. Before you spring for a new Wi-Fi 5 router, you may want to try a relatively inexpensive Wi-Fi booster (aka powerline adapter or extender). These small devices capture and amplify the wireless signal coming from your router. By amplifying the signal, you’ll increase your network’s overall Wi-Fi coverage. On the other hand, if you’re really ready to trade up to the much faster speeds of Wi-Fi 5, you may want to buy both a new Wi-Fi 5 router and a Wi-Fi 5 booster. Many routers and boosters come with the ability to communicate at both 2.4 GHz and 5 GHz. These so-called “dual band” routers may be either Wi-Fi 4 or Wi-Fi 5. You may have to look closely to tell which is which. A Wi-Fi 4 dual band router is sending signal under the 802.11n standard from both bandwidths. In other words, the 2.4 GHz and 5 GHz signals are both operating at the lower Wi-Fi 4 speeds (up to 600 Mbps). A Wi-Fi 5 dual band router still sends the 2.4 GHz signal at the lower Wi-Fi 4 speed. But the higher-frequency 5 GHz signal is sent at the higher Wi-Fi 5 speed (up to 1300 Mbps). The dual bands (and dual specifications) in the Wi-Fi 5 router allow it to work with older devices, while supplying the best possible performance to newer devices. To know the highest standard a given router is operating under, you can usually look for “N” or “AC” in the model number. But to be certain, you may need to take a look at the specifications on the manufacturer’s website. Ponying up for an expensive new Wi-Fi 5 router won’t do you a bit of good if your trading computer can only receive Wi-Fi 4 signal. If you’re trading over Wi-Fi, make sure your computer has a Wi-Fi 5 (802.11ac) adapter. But if you see a model with an “N” in the name instead, your speed is limited to Wi-Fi 4 levels. Most traders are going to want to go for routers and trading computers with Wi-Fi 5 because of the faster speed. If you’re in the market for a new router, getting a Wi-Fi 5 router with dual bands is the smartest option. Also consider the distance and the number of walls between your router and your trading computer or Wi-Fi device. You’re going to get increased disruption as you move away from the router. A strategically placed booster can make a big difference. As with any technology, there is a trade-off between cost and performance. But given the impact of speed and reliable connections on stock trading, it’s not difficult to justify having a Wi-Fi 5 system. The important thing is to know your options so you can make an informed decision. There are more trading computer tips like this in our buyer’s guide. 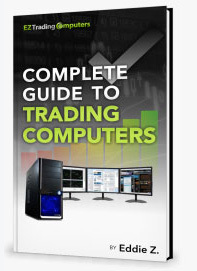 Check out our “How To Buy a Trading Computer” e-book. Remember, we are here to help with all your technology-related questions. If you think of additional questions about computer hardware or other questions, give me a call. My team and I are here to help. We’re happy to answer any of your questions about trading computers via phone: 800-387-5250. Photo by Isaac Jenks on Unsplash. "How To Buy A Trading Computer"
Your Privacy Is Our #1 Priority! We NEVER Sell Your Information.